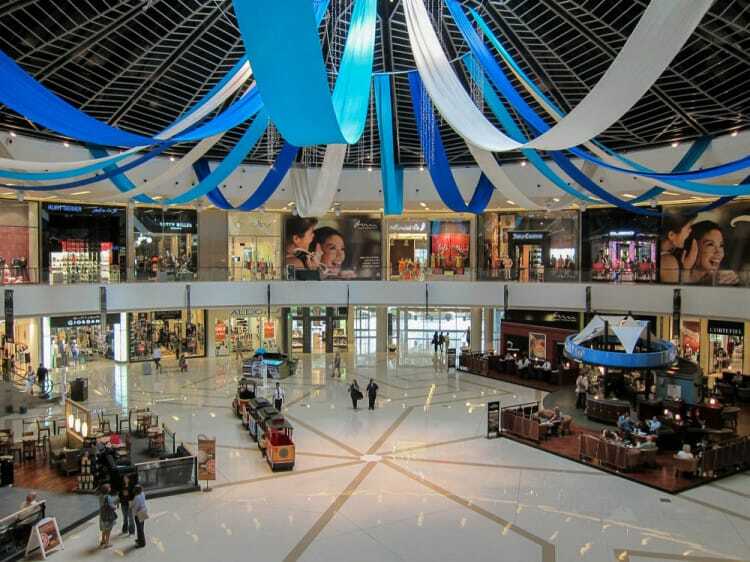 Situated within the fashionable neighbourhood of Dubai Marina, this mall is relatively small by Dubai standards. The 4-level mall features a large circular atrium and a promenade that extends onto the waterfront. 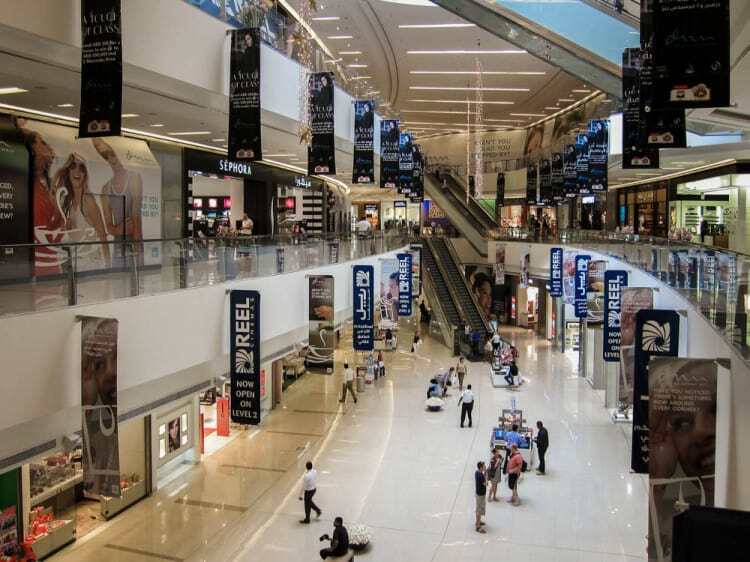 In addition to a good range of shops the Dubai Marina Mall offers a cinema, a community supermarket, a number of restaurants and food and beverage outlets, and a children’s play and activity centre (Little Explorers). 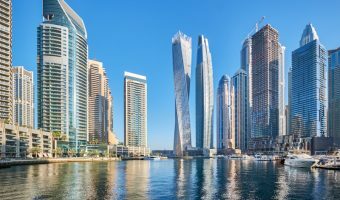 Shops at the Dubai Marina Mall are listed below. The list was last updated on March 1, 2019 . 1915 By Seddiqi – Watches. Accessorize – Fashion accessories including bags, purses, jewellery, belts, scarves, and gloves. African + Eastern – Alcohol store. Alessandro Dell'Acqua – Italian fashion. Al Jaber Gallery – Arts, crafts, carpets, souvenirs etc. Ascots & Chapels – Men’s tailors. Baldi – Crystal vases, chandeliers, tableware etc. Balmain – French fashion house. Bath & Body Works - Soaps, shower gels, lotions, fragrances, gift sets etc. Billabong – Australian fashion and sportswear. Birkenstock – German sandals and footwear. Boots – Pharmacy, health and beauty products. Borders Express – Books, stationery, greeting cards, games etc. Carter’s – Clothes for children, toddlers, and babies. Charles & Keith – Women’s footwear, bags, and accessories. Cole Haan – Bags and accessories. COS - Collection of Style – Fashion for women and men. Damas – Jewellery and watches. Desigual – Spanish brand offering casual clothing for men and women. Destination Maternity – Maternity clothing and products for newborn babies. Dune – Shoes, bags, and accessories. Early Learning Centre – Educational toys, games, and gifts. Gant – Casual clothes for men and women. Good Health Nutrition – Nutrition, sports, and dietary supplements. Grand Stores Digital – Consumer electronics, IT, cameras etc. Guess – Fashion and accessories for men and women. H&M – Fashion for men, women, and children. Hallmark – Greeting cards, stationery, and gifts. Iconic – Fashion for men, women, and children. Kate Spade – Womenswear from New York. Kiehl’s – Skin, hair, and body care products. L’Occitane – Skincare products, fragrances, bath and body products, soap, hair products etc. Lakeland – Cookware and kitchenware. La Senza – Lingerie, underwear, nightwear, and swimwear. Lego - Lego toys and games. Lululemon Athletica - Yoga-focused athletic clothing. Mothercare – Clothes for babies, mothers, and children. Feeding products, nursery furniture, prams, car seats and travel accessories etc. Nespresso – Coffee machines and accessories. NStyle – Nail and beauty salon. Quiksilver – Surfwear and casual fashion. Redha Al Ansari Exchange – Foreign currency exchange and money transfers. Reiss – UK fashion brand. River Island – Fashion for men, women, and children. Sacoor Brothers – Fashion for men and women. Scotch & Soda – Amsterdam-based fashion brand. Seafolly – Australian swimwear brand. Sephora – Cosmetics, skin care, perfume, hair products etc. Steve Madden – Footwear for women and men. Sunglass Hut – Designer sunglasses. Super Care Pharmacy – Pharmacy. The Body Shop – Natural bath and body products, cosmetics etc. The North Face – Jackets and outerwear, winter sports clothing, footwear etc. The Toy Store – Toys and games. Tommy Bahama – Island-inspired fashion. U.S. Polo Assn. – Clothing and fashion accessories for men, women, and children. Virgin Megastore – CDs, DVDs, books, mobile phones, electronics, games etc. Zippy – Children’s clothes from Portugal. Fashion shops make up the bulk of the retail offerings here and include Billabong (skate and surf clothing), Diesel, Bebe, H&M, Ted Baker, Juicy Couture, Karen Millen, and La Senza. Ascots & Chapels offer a bespoke tailoring service for men. There are also a good number of health and beauty stores such as Boots, MAC, Sephora, Bobbi Brown, and The Body Shop. Stores selling shoes and accessories include Accessorize, Aldo, Cole Haan, and Ecco. The mall also has a good selection of opticians. Al Jaber Optical, Magrabi Optical and Vision Express are all here. UK supermarket chain Waitrose has a large store on the Promenade Level. 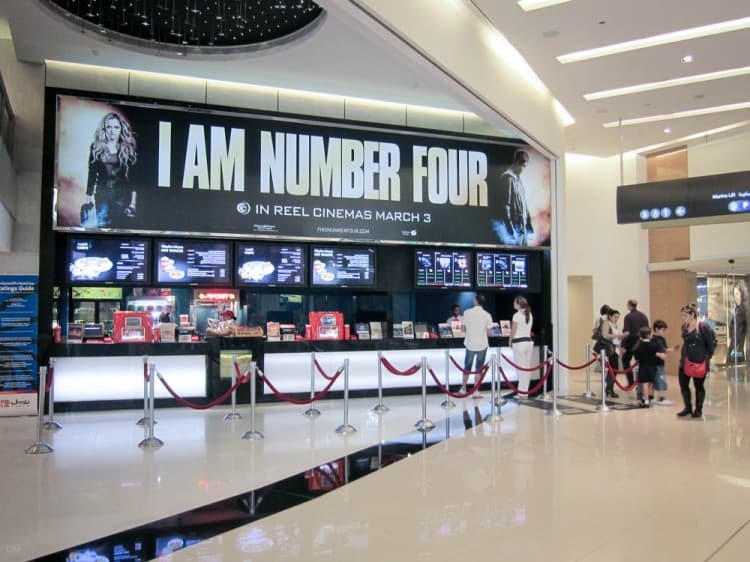 The top floor of the mall is home to Reel Cinemas, a 6-screen ‘boutique’ cinema. Restaurants and places to eat and drink at the Dubai Marina Mall are listed below. Baskin Robbins (Level 2 Food Court) – Ice cream, desserts, and shakes. Bateel (Promenade Level) – Gourmet dates and confectionery. Caffè Nero (Ground Level) – Coffeehouse. Carluccio’s (Promenade Level) – Italian restaurant. Cinnabon (Level 2 Food Court) – Cinnamon rolls. Doner & Gyros (Level 2 Food Court) – Street food. Five Guys (Ground Level) – Burgers, hot dogs, fries, shakes etc. Gourmet Burger Kitchen (Promenade Level) – Burger restaurant. Le Pain Quotidien (Promenade Level) – Organic bakery and cafe. Menu includes breakfast, pastries, eggs, soups, salads, and healthy mains. McDonald’s (Level 2 Food Court) – Burgers, fries, and salads. Shakespeare and Co. (Ground Level) – Offers breakfast, crepes, salads, sandwiches and wraps, burgers, and pasta. Starbucks (Ground Level) – Coffeehouse. Vivel Patisserie (Promenade Level) – Desserts, cakes, cookies etc. Yo! Sushi (Promenade Level) – Japanese. Zafran (Ground Level) – Indian restaurant. Facilities and services at the mall include toilets, baby changing areas, guest services desk, and pushchair hire. The Dubai Marina Mall is open 7 days a week. Opening times are Saturday to Wednesday 10 am to 10 pm, and Thursday and Friday 10 am to midnight. 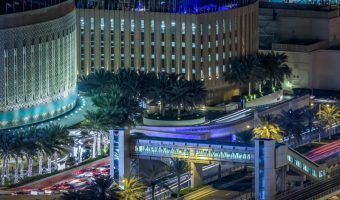 The mall is situated on the eastern side of Dubai Marina, within easy walking distance of Jumeirah Beach Residence and The Walk. 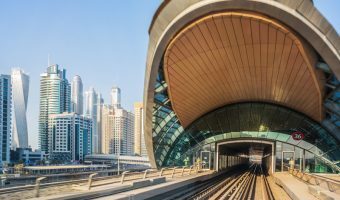 The nearest Metro stations are Jumeirah Lakes Towers and DAMAC, both on the Red Line and around a 10 minute walk to the mall. Dubai Marina Mall can also be reached using the Dubai Tram. Dubai Marina Mall Tram Station is adjacent to the mall. 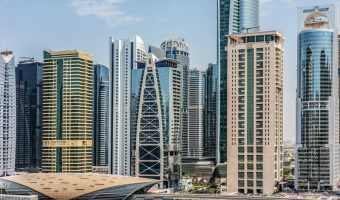 The Address Dubai Marina is a 5-star hotel attached to the mall. It offers 200 rooms, a spa, swimming pool, and fitness centre, plus several licensed restaurants and lounges. Map showing location of Dubai Marina Mall. Recent openings include Lego and Little Explorers. Little Explorers is an activity centre for kids aged 2 to 7. Metro Station on the Red Line serving Dubai Marina and Jumeirah Lakes Towers. Tram station adjacent to the Dubai Marina Mall. Serves Dubai Marina and Jumeirah Lakes Towers. Small cinema at the Dubai Marina Mall. View movie listings and showtimes.